Pesticides are chemicals intended to prevent infestation of fresh produce by pests. Produce pests include insects and bugs, birds and some mammals, microbes, weeds and plant pathogens, among others. While pesticides prevent infestation, they also pose a threat to human health because they can be harmful when ingested. Conventional, non-organic produce runs a higher risk of pesticides than organic produce, but you can remedy this with a solution of sea salt, which is a natural disinfectant. Fill a sink or container with lukewarm water using a measuring cup. Keep track of how many cups it takes to fill the sink or container with water. Add one teaspoon of sea salt for every cup of water used to fill the container or sink. Stir the mixture with a serving spoon or other appropriate kitchen utensil. 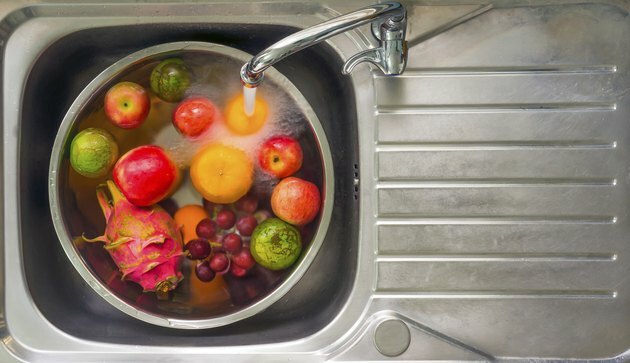 Place all fruits and vegetables in the sink or container and let them soak for at least two minutes. A vegetable scrub can be used to further remove pesticides with a gentle brushing of the produce exterior. Rinse the vegetables with fresh water and store them in the refrigerator.